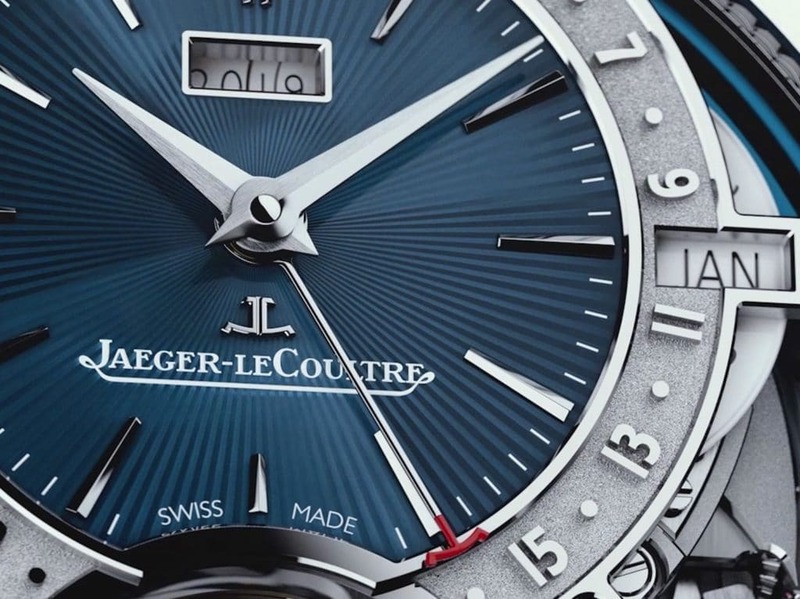 If you’re one of those people inclined to describe Jaeger-LeCoultre as “the Richemont brand that makes Reversos”, you may want to think again. At SIHH 2019, the 186-year old Le Sentier manufacture unveiled the Master Grande Tradition Gyrotourbillon Westminster Perpétuel — a high complication timepiece which took six years to develop and was inarguably the most complicated watch of the show (Vacheron Constantin’s Traditionelle Twin Beat came in a close second). Even the raw statistics surrounding the Gyrotourbillon’s development are instructive: assembled from 1,050 components and the subject of 12 different patents, it marks the fifth time that JLC have tackled the eponymous multi-axis tourbillon — a specialty of theirs since the introduction of the Gyrotourbillon 1 in 2004. 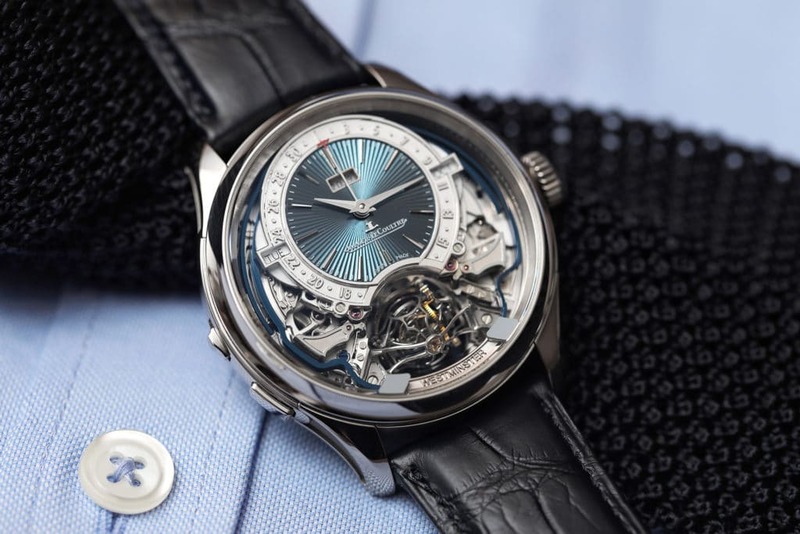 Jaeger-LeCoultre’s newest iteration of the Gyrotourbillon notably features a reduced tourbillon carriage, freeing up enough space for the regulating device to be combined with a perpetual calendar and “Westminster” minute repeater. Given the ongoing expertise of JLC watchmakers in the development of multi-axis tourbillons, for 2019 the brand sought to tackle the issue of miniaturisation. Beyond physical difficulties associated with making the tourbillon carriage smaller (e.g. gravity and error tolerance), JLC had to contend with how this regulating mechanism would integrate effectively with two other complications — namely the perpetual calendar and minute repeater. Keep in mind that while the manufacture have worked with these complications before, this is the first time (to the best of my knowledge) they’ve all been combined in one relatively compact package. The tourbillon is widely thought of as the most virtuosic looking high complication, so it made sense for JLC to pair it with the minute repeater — that sonic mechanism which enables a watch to sound the time on demand. The particular version used by the Gyrotourbillon comprises a series of four hammers that chime the melody of the Big Ben clock tower — hence the “Westminster” moniker — to indicate the quarters, whenever the minute repeater is actuated via the pusher at 8 o’clock. In order to make the chime as sonorous as possible, JLC designers opted for a patented design in which the repeater’s gongs are welded directly to the sapphire crystal of the watch. Watchmakers traditionally opt to attach the gongs directly to the movement, but in the present design striking upon a crystalline surface lends each chime significantly more volume and clarity. A close up of the Gyrotourbillon’s dial (which integrates the QP display) including features such as: the year; month; and GMT-style pointer for the date. To round out the Gyrotourbillon’s trio of high watchmaking features, JLC opted for a slightly more mundane (albeit extremely pragmatic) complication in the form of the perpetual calendar. Of the bidirectional variety — most conventional QPs can only be adjusted forward in time — this particular perpetual calendar uses three apertures (at 12, 3 and 9 o’clock) in order to display the year, month and day. The date meanwhile is indicated in the outermost segment of the dial and read using a GMT-style pointer that is highlighted in red. Pictured: the calibre 184 powering Jaeger-LeCoultre’s newest tourbillon. Note the snail cams and racks, which can be viewed in motion when the pusher at 8 o’clock is actuated. Understandably, the amount of energy required to power not one but three complications (particularly the power-hungry multi-axis tourbillon) is considerable. 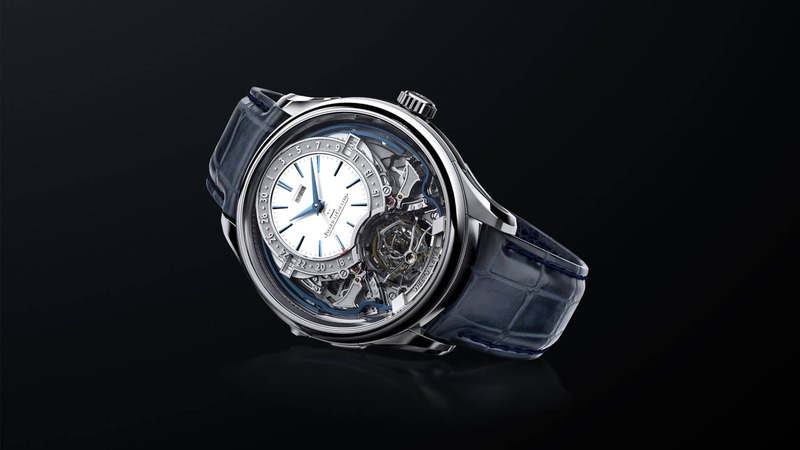 To address this concern, JLC designed the calibre 184 (pictured above) with a remontoir d’égalité — a device that takes the form of a buffer spring doubling as a secondary power source for the Gyrotourbillon. It also fulfils an additional role as a regulator: since the remontoir rearms itself once every 60 seconds, chiming errors (which can occur when the repeater is activated between minutes) are more or less eliminated, resulting in a watch that offers greater precision, with the time displayed and chimed both being identical. As you’d expect, the degree of finishing on-display is truly next level: evincing anglage, black polishing and a minefield of blued screws across the caseback. The calibre 184 is beautiful no question, but whether that intricate aesthetic style translates effectively on the dial is more open to contention. A multitude of finishes — guilloché, open-working, brushing — all vie for attention, giving the Gyrotourbillon almost too many points of interest to latch onto when viewing the time. Then again, if you’re all about timepieces which expose the “innards” of complications, JLC’s latest is likely to tickle your fancy — even if only as a proof of concept. 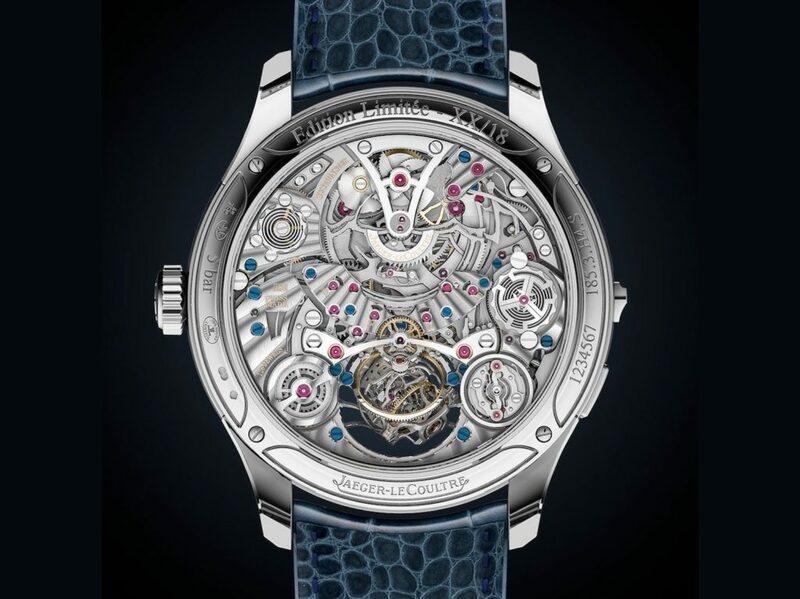 The Jaeger-LeCoultre Master Grande Tradition Gyrotourbillon Westminster Perpétuel is available for (approx) HK$7.1 million. Production is limited to 18 piece worldwide and includes two models with silver grained and blue guilloché dials. To learn more, visit Jaeger-LeCoultre online. Having worked in the Australian digital media landscape for over 5 years, Randy has extensive experience in men's specialist categories such as classic clothing, watches and spirits. He is partial to mid-century chronographs and a nice chianti. Want more cutting-edge coverage of the latest fashions? Sign up for our weekly newsletters.